Adagio is another symphonic gathering this time under the leadership of guitar talent Stephan Forte. The band specializes in guitar and keyboard-oriented rock with plenty of classical influences. Pink Cream 69’s Dennis Ward produced the debut. The band has steadily drifted towards the neoclassical sound. After conflicts between Adagio and David Readman’s management the band recruited Gus Monsanto of Brazil following an Internet plea for singers. The band was picked to open for Robert Plant in Tunisia in 2006 at the International Mediterranean Guitar Festival. 2005’s Dominate was the band’s fourth album on the fourth label and was issued in Europe in 2006 through Locomotive. In the same year, Forte announced his intention to record an instrumental solo album. 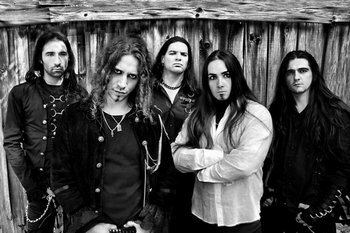 The band announced its plans to enter the studio in December, 2006 in order to record a new album called Archangels In Black. Adagio lost singer Gus Monsantoi in 2008 who wanted to focus on his own band The Lightseekers. He had also joined Takara. Finnish singer Christian Palin (Essence Of Sorrow) replaced Gus. The group cancelled its opening slot of the French portion of Firewind 's tour for unexplained reasons. The band’s next album was called Archangels In Black and was expected three years behind schedule in January, 2009. Gus Monsanto was in Revolution Renaissance, the new band of Timo Tolkki of Stratovarius. Adagio asked its Finnish singer Christian Palin to leave the band in early 2010. The band quickly recruited vocalist Mats Levén (Yngwie Malmsteen, Therion and Treat) at least for its upcoming European tour as the support band for Kamelot. Vocalist Kelly Sundown Carpenter (inner Sanctum, Firewind, etc.) and drummer Jelly Cardarelli joined in 2016. The band also hooked a violinsit. The band issued a demo through its Zeta Nemesis Records’ imprint in 2017. The most powerful thing about this album is… its cover… artwork… as opposed to the cover version of Irene Cara’s Fame. While musically appropriate for the band to cover a blatant pop/dance song, someone’s head needs to be screwed on correctly if these guys fantasize about achieving fame. Heavy metal infamy perhaps; fame never.